I briefly made it to the rescheduled SIBA SE beer competition yesterday. Driving through London is such a pleasant experience I wonder why I don't do it more often. When I finally got to the venue they'd already started announcing the results. Good job I'd got there though as we won two silvers and a bronze. Then I had a swift half of unfined beer (it tasted fine but did have a slight haze), chatted to someone that actually noticed the Brett in my Imperial Russian Stout and then spent two hours crawling home* from South London. * When I say home I did actually call in at The Crown first, and yes I did have a swifty, but I had beer to deliver too so really I was still working. My mate Rob of Mordue brewery has been kind enough to send me a bottle of Pandazilla, a beer made under his own Panda and Frog label, with his signature on the bottle and everything. Already owning a copy of Rob's signature I'm not easily impressed, but it's a fantastic label, so well done to the designer. The beer is a Cascadian Dark Ale, craftily avoiding the oxymoronic term Black IPA. It's not my favourite style of beer. Maybe the cognitive dissonance of it scrambles my taste buds. 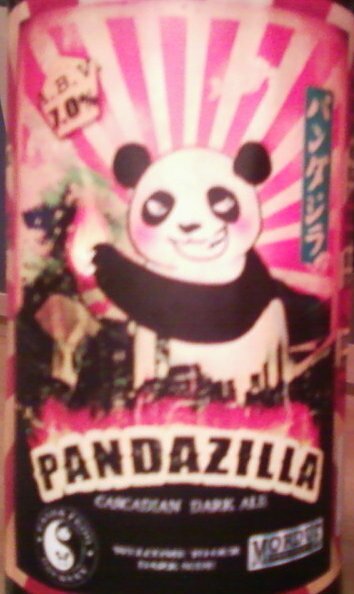 But with a powerful whack of the sort of hops Darth Vader would approve of, enough dark malt taste to provide a bit of contrast and being surprising drinkable I necked the Pandazilla with great speed. Nice one Rob, maybe I should give these new fangled weirdly named whatsits a go more often. Boak and Bailey's post about alternate history got me thinking again about something I've pondered about for a while. They were wondering about what British beer would be like if CAMRA had never existed. It's an interesting question but as to the answer we can only speculate. Something I'd like to know more about though is how did cask beer die out in other countries? At one point all draught beer must have been cask beer, and outside of Britain at some point in the 20th century it died a death and was replaced by keg. 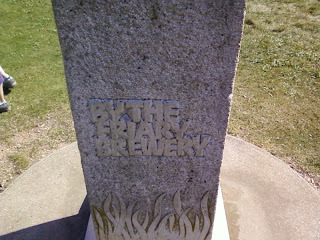 Ireland must be the closest to Britain in terms of beer history and as far as I'm aware went totally keg. Australia and New Zealand must have had a strong influence from British brewing, as indeed must Canada and the USA. So where did it all go wrong? Did any brewers try and hold out? Did any drinkers put up a fight? Were any organisations formed? And what happened in Europe? There are still lots of small breweries in Germany, and I've seen pictures of wooden barrels being tapped at beer festivals there. 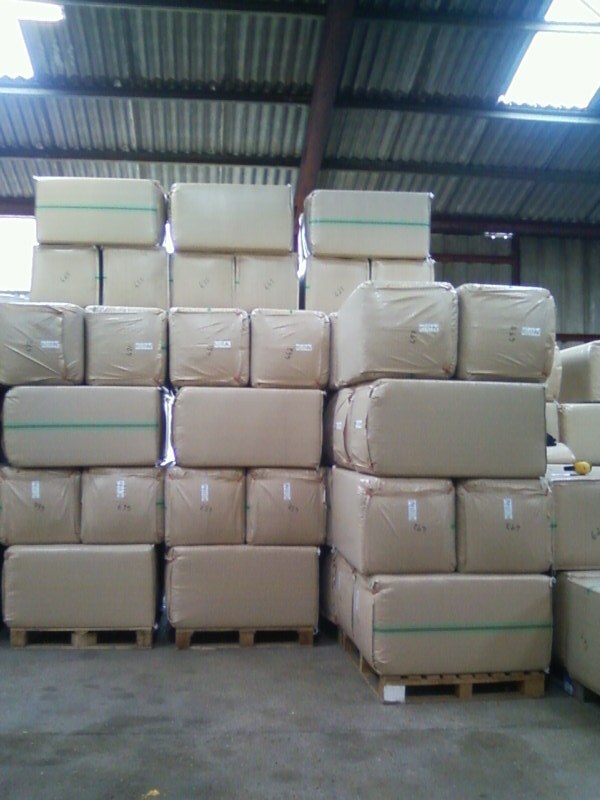 Are these filled with bright beer or are they cask conditioned? It was non stop hops for me on Friday. 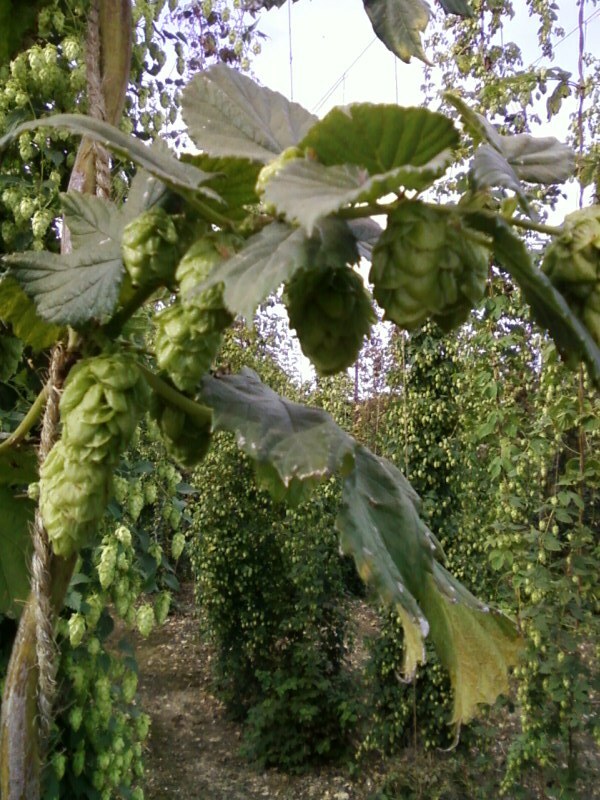 First I went to a hop garden to pick up some undried hops for the last of the Kent Green Hop beers we'll be making this year. The farm is near Goudhurst and as I drive past it every day it was good to have a look around. 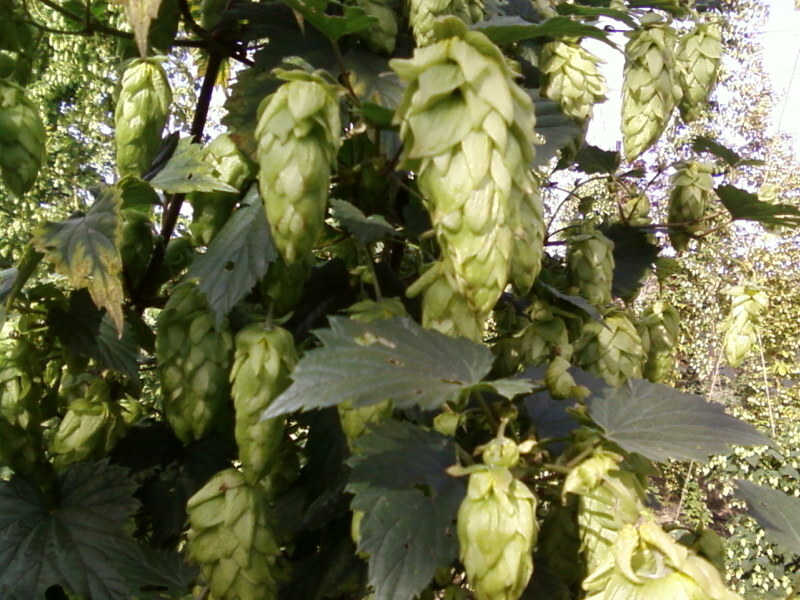 Hops can be classified according to their ripening time: early, mid or late season. 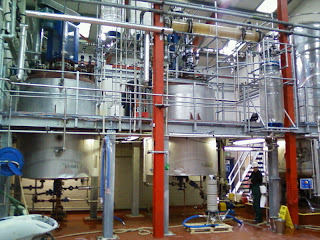 We've take advantage of this to make three green hop beers using Early Choice "Golding", Bramling Cross, and now Target. The beers have turned out really well so far. I'd say Bramling Cross has the edge on Early Choice and it will be interesting to see how the Target turns out. It's known as a bittering, not an aroma, variety but I have heard you can get some interesting flavours off it, and as it won't even have been kilned lets hope we do. After I'd delivered the green hops to the brewery it wasn't long before I was off again to Botanix, the hop company behind Simply Hops, for their open day. 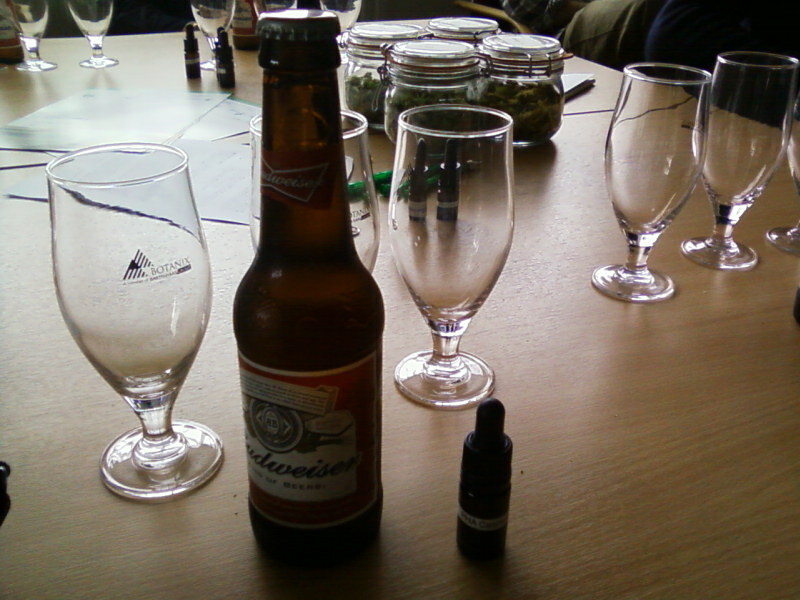 We were treated to talks from a couple of hop experts, a tour, and got to play with hop extracts, which I've long been curious about. The tour was a brief afair. Having once discussed the joys of the Reynolds number and theoretical plates with Botanix big cheese John Moss I was looking forward to the tour, but as it turned out there was so many of us and so little time he didn't really have a chance to go into much detail. Vitally important questions about CO2 extraction will have to wait for another day. But I am pleased to report that they're got a new packing machine so the hops will come in more user friendly packets. When it came to the playing with the extracts as seems to be the industry standard we used Bud as the base beer, and had bitter and Cascade aroma extracts in dropper bottles to add to taste. Despite there being a recent outbreak of approval for extracts amongst the bloggerati I've been sceptical myself. Blame it on my biologist background but I'm dubious that somethings as complicated as the resins and oils of a plant can be replaced with a purified extract without affecting the flavour. Even at the simple level of bitterness there are six forms of iso-alpha acids found in beer which have different flavour characteristics, and they are by no means the only compounds that give beer bitterness. As to hop aroma there are hundreds of compounds involved. Extracting and purifying hop compounds will inevitably lead to a loss in complexity of flavour, even if it makes it easier to increase the intensity. 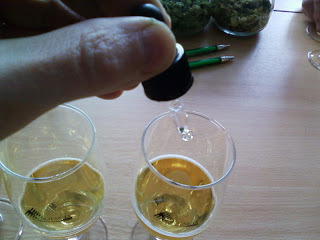 The extracts we have were rho-iso-alpha acid for bitterness and Cascade Pure Hop Aroma for flavour. The bittering extract did its job well and certainly improved the Bud, though I'm sure if the brewers had used more hops in the first place it would have been better still. The aroma extract was not so good. It certainly added flavour but I didn't get the characteristic grapefruit flavour I expect from Cascade. Interesting stuff though, and I quite like the idea of having a dropper bottle of bitter extract handy to pep up a dull beer. Then it was time for beer and nibbles, I mean networking, but the usual problem of having to drive meant my networking was restricted to one bottle. I did get to talk to lots of people though, which was nice. 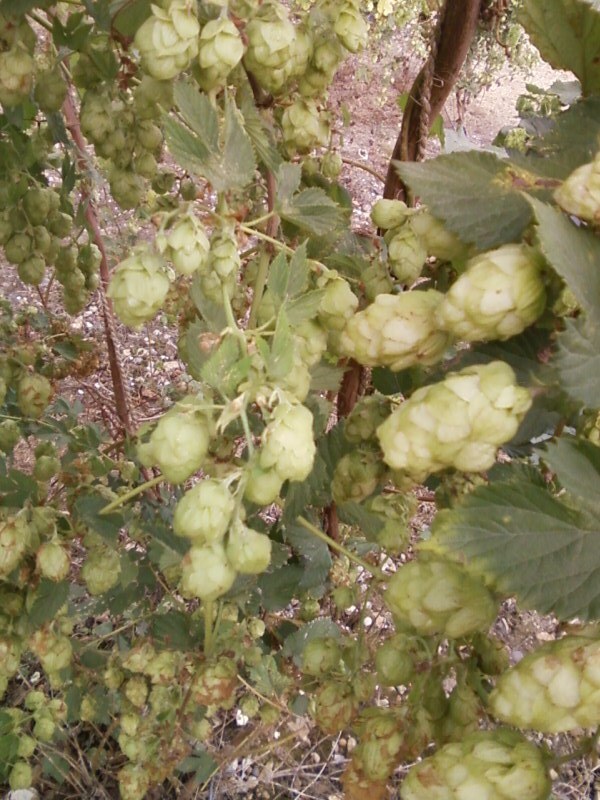 There's some good news and there's some bad news.Speaking to Peter Darby of Wye Hops Ltd on Friday I found out that the Flyer hop is in fact one of his varieties. Sadly it didn't have the alpha acid value that was hoped for so won't be going beyond farm trials. It's a shame it's being judged on its bittering power as I thought it had a great flavour. And on the plus It seems I got the facts right in my account of how to breed new hop varieties. 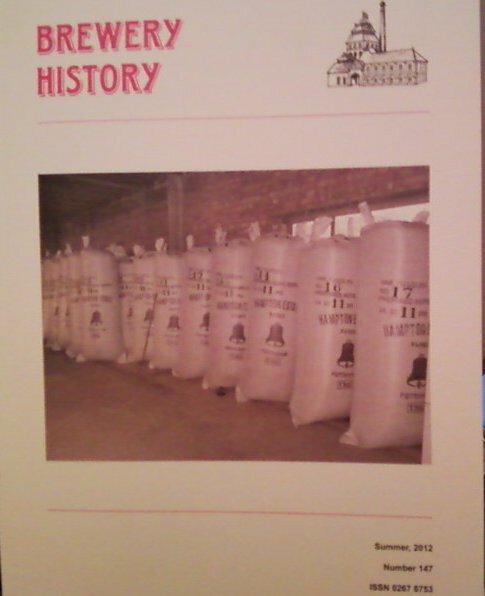 The recently published history of the Institute of Brewing and Distilling "Brewers and Distillers by Profession" has proved a fascinating read. As well as seeing how the IBD got to be as it is, there are some great pieces about brewers' views on beer. "...may produce a uniform and satisfactory product... but so is milk and it tastes the same wherever you drink it ...it was no wonder that the brewers' product, or the taking thereof, gave rise to so much adverse criticism in the press." He then praised "good old-fashioned beer matured and fined in the wood" before adding "...that in years to come the discriminating beer drinker would seek out beer so presented and regard his find in much the same way as an antiquarian discovering a rare piece of porcelain." As this comes after the Society for the Preservation of Beer from the Wood had been founded, and it looks like they had allies in the brewing industry and in the press. Regular readers of this blog will know that I am already famous, being mentioned in a book by name and nearly being on the telly. I am now also a published author. In issue 147 of Brewery History is my article on the Farnham Whitebine hop. And they've even used a picture from my article on the cover. Now admittedly, though this obviously makes me even more famous, the fortune has not arrive yet as I wasn't paid for it. But surely the requests for the film rights will soon be flooding in, and I'm bound to get loads of money for that. I wonder if I'll have a say about who plays Peckham Williams in the Hollywood version? Actually, maybe that's not such a good idea, knowing how American films are they'd probably re-write all the history and move the location to somewhere in the States. 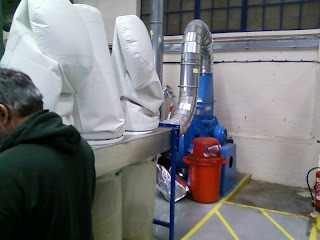 After the excitement of visiting a Farnham hop kiln we went to Guildford for more Heritage Open Day excitement. 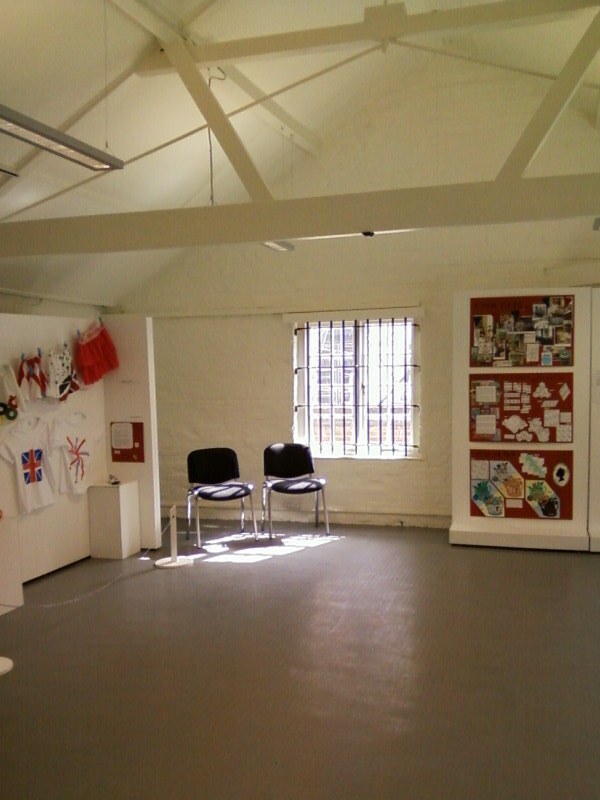 Apparently the funding for Heritage Open Days has been cut so next year could be less exciting. The medieval wine cellar in the high street was good, we've decided we want one ourselves. The medieval brew house with a bit rubbish though, being an empty room upstairs with a sixth form textiles exhibition taking place, and a craft shop downstairs. 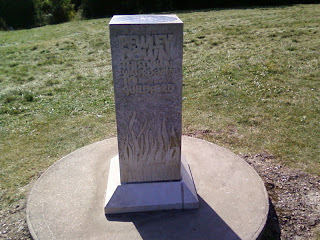 Being the stuff of epics scaling the heights of Guildford high street was not enough for us and we carried on to Chilworth via Pewley Down. Quite unexpectedly this provided the biggest bit of brewery based excitement as there was a pillar there saying that Pewley Down was donated to Guildford by the Friary Brewery (note the hop pockets stamped with the Farnham bell in one of the pictures). I'd never heard of Pewley Down until we got there, let alone that it was donated by the Friary Brewery, so this was quite a surprise and as is so often the case more research is needed. Then it was on to Chillworth and a derelict gunpowder mill built by the East India Company. It felt slightly odd being guided round as I'm so used to brewery trips where I know what's going on but I know next to nothing about making gunpowder. It's good to have a bit of variety though. Then it was time for the walk back, and yes we did call in at a pub on the way home, but it wasn't really worth talking about so I won't. At the weekend we were able to take advantage of the Heritage Open Days. 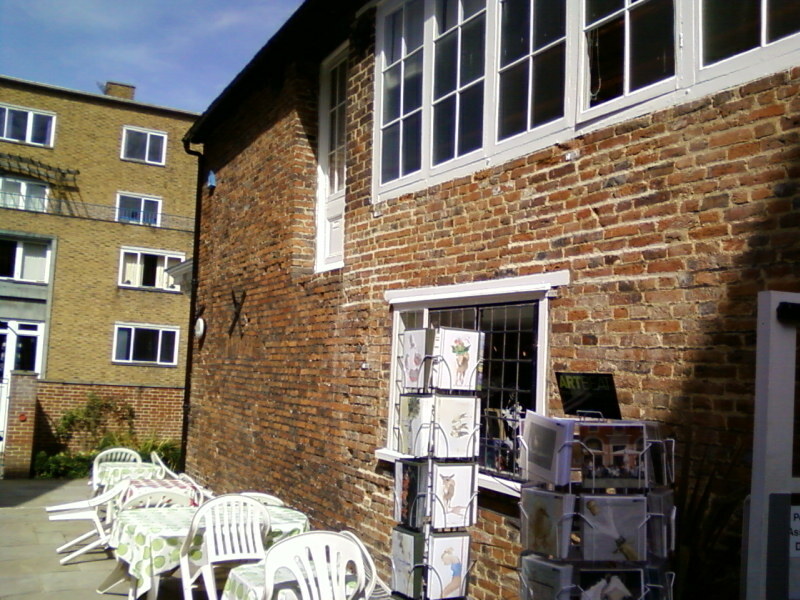 The lovely Lisa had spotted that a Farnham hop kiln at Hone's Yard was open to the public and there was no way I could miss that. 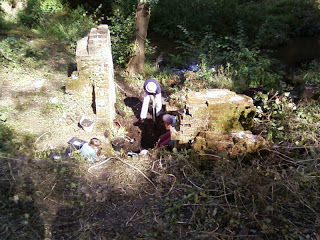 The round kiln had lost its top but I was still glad to see it. 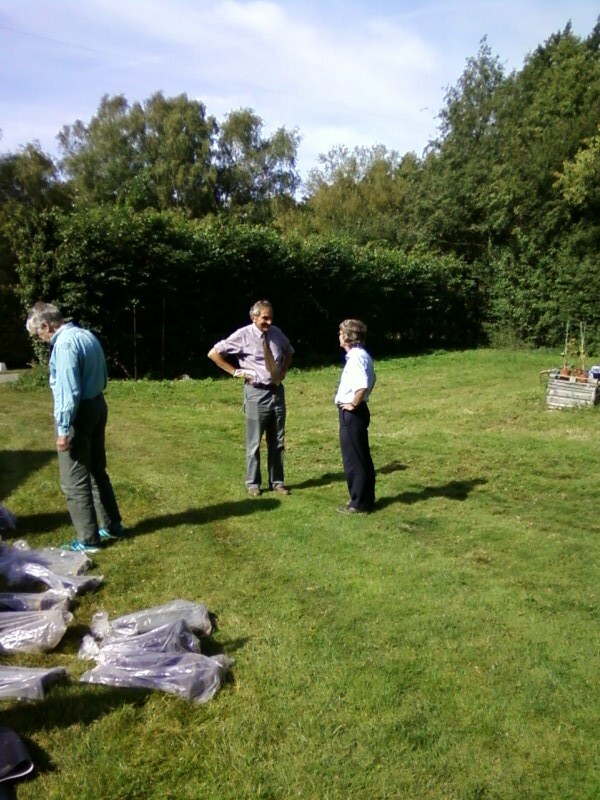 Even better was the fact a volunteer was there who had researched the history of Farnham hops himself and he had a selection of pictures with him. Hops were grown right up to Farnham town centre. The hop ground now has a Waitrose and car park on it. 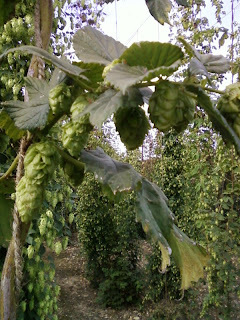 They were filling hop pockets just like this in a hop garden I went to on Tuesday. 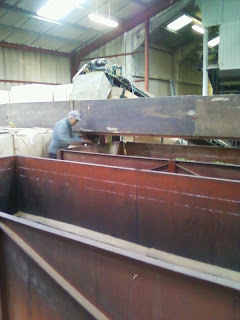 This is a hole were the hop pockets would be filled. It was great to meet another Farnham hop fan and he was a lovely guy. There was more hop based excitement to be had though, and we popped into the hop room at the Farnham museum (which is itself a hop growers house dating from 1718). After that we'd worked up a thirst so it was time for a beer. And which pub did we go to? The Hop Blossom of course. As any fule kno to get a new hop variety all you need to do is plant a seed. As each hop variety is really just an individual plant that has been replicated from cuttings, and because each seed has two parents and the usual genetic recombination, each plant from seed is a new variety. Hope you're still with me. But easy though it may be to grow a new hop variety growing a worthwhile new variety is a little trickier. Though some still try Mr Fuggle's method, Peter Darby takes a more scientific approach. Decide which plants you want as parents. Put a parchment bag over the mother before the flowers open. The parchment bags allow the hops to breath. Timing is crucial as too early with the bag and the flowers could be aborted, too late and the flowers could be pollinated randomly. Add pollen from the father to the bag. It's diluted with powder to prevent clumping. Have a bag of unpollinated flowers to use as a control. If these grow seeds then you were too late putting the bag on, random pollination has occurred and your crosses might not be what you think they are. Gather the seeds from your hop crosses. Sow 20,000 seeds each year. Expose the plants to downy mildew. This will kill 5 out of 6 of the plants. Expose the plants to powdery mildew. This will kill more. Select 1400 to 1500 hops to plant in a field. Let them grow with irrigation for the first year to ensure good growth. Pick approximately 100 hops for further analysis each year, this will get narrowed down to around 40. Testing for wilt resistance is done abroad. By the fifth year selected plants will be ready for farm trials. Wye Hops Ltd have now been going for long enough that the varieties coming through are entirely from work carried out after after they became independent of Wye College. That's not a small hand, it's a big hop. 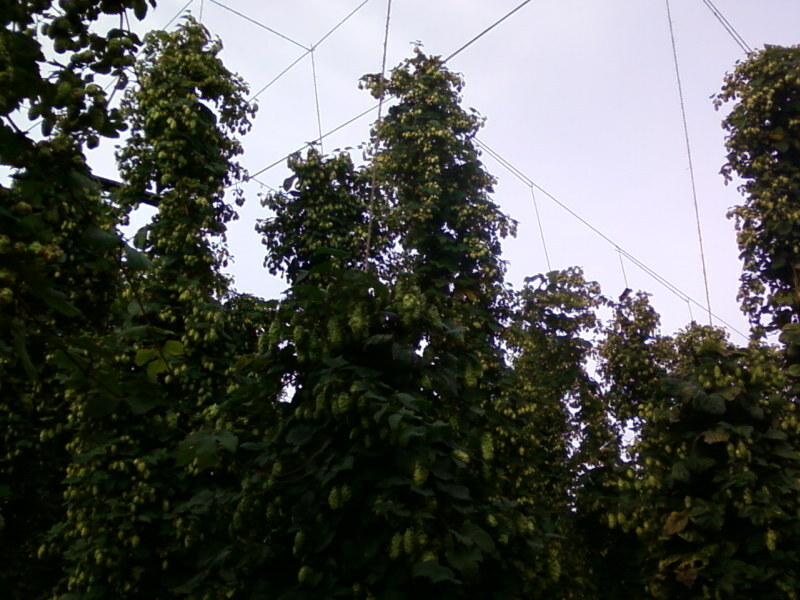 The hop plants in the breeding programme looked like a right freak show of hops, with the size, shape and how they hang showing massive variation. The National Scientific Hop Collection, with varieties going back to at least 1737, provides a wealth of genetic material for breeding. Seedings have been grown from hops selected for spicy and citrus flavours crossed with hops having pest and disease resistance. 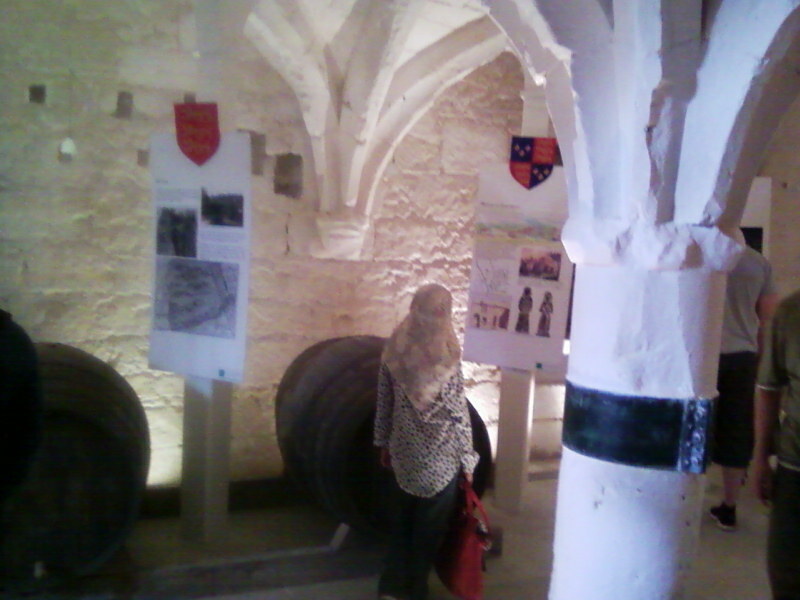 It also made me happy seeing a particular historic variety. On Thursday the lovely Lisa and I went on a Brewery History Society trip to the National Scientific Hop Collection and China Farm near Canterbury where it's hosted. 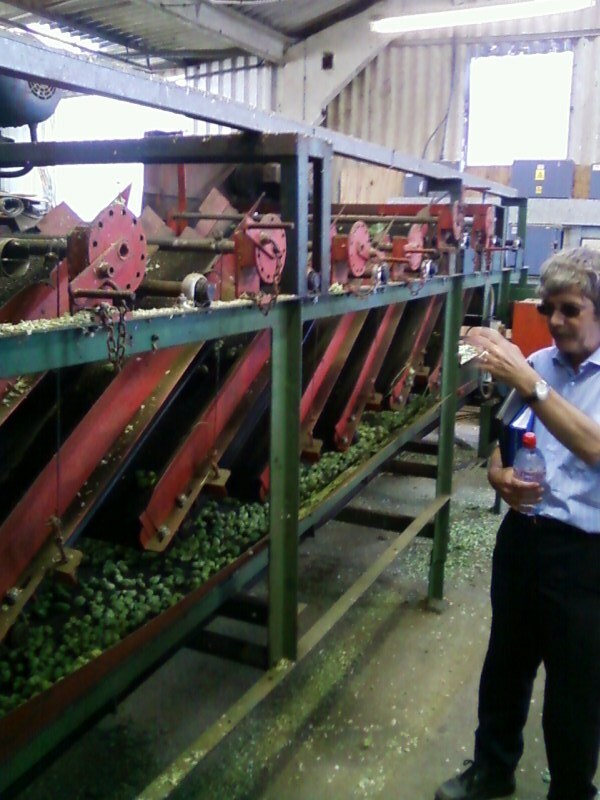 Farm owner Tony Redsell welcomed us and Peter Darby of Wye Hops Ltd was there to guide us round, explain the hop breeding programme and show us the historic hop collection. The building where the hops were processed was the equivalent of eight traditional oast houses and could be run by only two people. 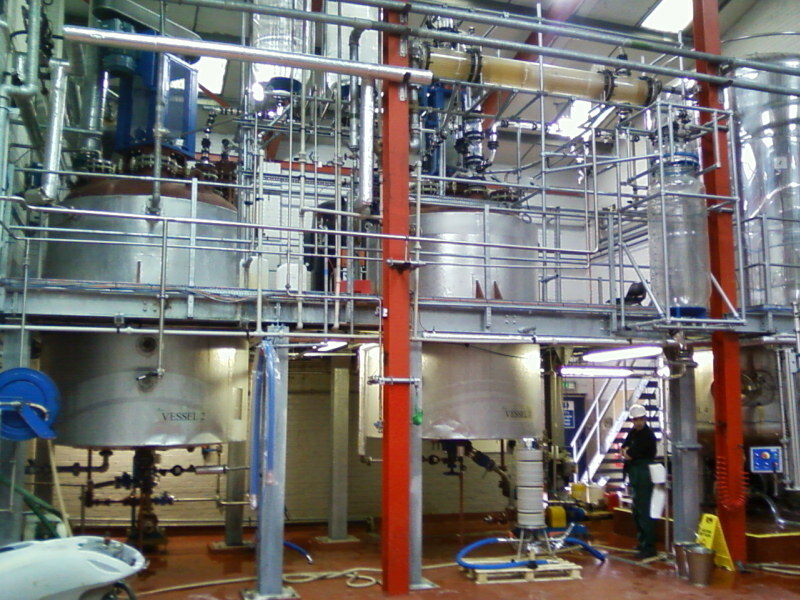 From the 1950s the hop industry became increasingly mechanised, which lead to the ending of production of many old varieties. Only Goldings, Fuggles and Whitbread's Golding Variety cones rolled well enough for mechanical separation from leaves. I'll be back to burble about the breeding later.